Are you tired of metal kettles that have buildup all over the insides? Or of glass kettles and their metal parts that give you that metallic after taste to your boiled water? The GROSCHE INDIGO is the answer. An elegant and durable stovetop kettle that's not only elegant, but is also functional and versatile. This stovetop kettle is made from Heatproof Borosilicate glass, which is safe for stovetop use on gas, ceramic, or electric burners (not for glass induction stovetops). Your water will boil faster with the unique heat conductivity properties of this superior and high clarity glass. It has a comfort-grip handle which makes this kettle easy to handle and comfortable to maneuver. One other unique characteristic of this item is that it can be converted into an infuser teapot with the GROSCHE Infuser Kit. Adding the infuser makes it into a flexible stovetop kettle and a stove top Infuser tea pot as well. Now that's unique! The large and flexible size means its great for boiling just the right amount of water, fast, with the cleanliness and clarity that only thermal glass can offer, with zero aftertaste. Dishwasher safe on top rack, wash with mild soap and soft brush. With reasonable care it can offer you many years of elegant use in your kitchen! THE GROSCHE MUNICH GLASS TEAPOT BEAUTIFUL, UNIQUE, AND FUNCTIONAL The MUNICH glass teapot is a high-quality all-glass infuser teapot. The MUNICH is an example of elegant design, and great functionality coming together in one gorgeous teapot. The all glad infuser is hand-made, and the glass slits allow for a full and complete infusion of your tea. The entire teapot is made of borosilicate glass which is a high grade thermal glass that can easily withstand boiling water. MAKING GREAT TEA Drop your desired amount of loose leaf tea into the infuser and gently pour boiled water through the infuser into the teapot. The tea will gain color and expand comfortably in the infuser giving you an elegant and high class tea experience. Once your tea has finished infusion, remove the infuser from your tea and replace the lid. Keep your finger on the lid as you serve 4-5 Mugs of amazing tea from your gorgeous glass teapot! 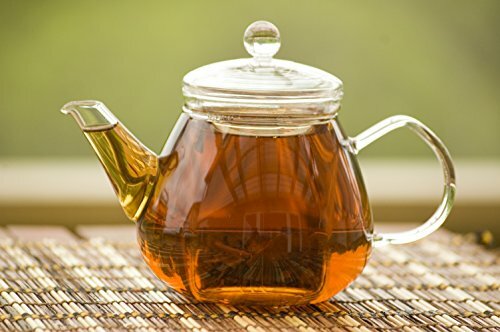 This teapot is a must for anyone that loves gourmet loose leaf tea! MATERIALS AND HANDLING The MUNICH is made from heatproof borosilicate glass which is the excellent material for handling hot liquids like boiling water as it is very similar to test tube glass. The MUNICH is dishwasher safe, but to avoid being knocked around or getting hit or damaged in the dishwasher, we recommend gently rinsing it out after use with some soapy water to keep it like new. Remember to keep your finger on the lid while pouring as this teapot uses NO silicone or plastics which can change the flavor of your tea.. The premium borosilicate glass is guaranteed against ever becoming cloudy even after years of use! WARRANTY Please contact Seller Rizpresso through Amazon email for ANY questions or concerns. You can also contact the Manufacturer directly or visit their website for replacement parts or any quality or tea making questions.